Mathieu Perreault found the back of the net thirteen seconds into the game Tuesday night and the Washington Capitals never looked back. Washington kept piling on the goals and netminder Tomas Vokoun remained stalwart in net, dominating until the final buzzer in a 4-0 shutout win over the Florida Panthers. With the victory, Washington (28-21-4) vaulted over Florida (24-17-11) into first place in the Southeast Division and the third spot overall in the Eastern Conference playoff picture, while the visiting Panthers tumbled to second place in the division and ninth in the conference. Head coach Dale Hunter termed Tuesday’s game a must-win “playoff game,” and the Capitals responded to their coach’s exhortation with aplomb. Captain Alex Ovechkin scored twice, and Perreault and Jason Chimera potted momentum-changers within the opening moments of the first and second period to keep Florida on its heels the entire game. Ovechkin led the way with one of his best “vintage Ovechkin” performances of the season. Both of his goals were things of beauty, perfectly placed wrist shots from the outside that left Panthers goalie Scott Clemmensen completely befuddled. Midway through the first period Washington had seen its energy disparate after Perreault’s early goal thirteen seconds into the game, and the Caps’ first power play effort was mired in its own end because of an energetic Florida forecheck. When Dennis Wideman finally broke the puck out of the team’s zone and across the Panthers’ blue line, he immediately dished to Ovechkin on the left boards, and the Russian winger wasted no time snapping the puck through Clemmensen’s legs to double Washington’s lead to 2-0. Almost exactly a period later Ovechkin again extended his team’s advantage, this time to 4-0, when Washington’s own forecheck forced Cats forward Sean Bergenheim to cough up the puck trying to clear the zone. Ovechkin swooped in to steal the loose puck, cut across to the top of the circles and unleashed another precision wrister that snuck just inside the left side of the crossbar for his 22nd goal of the season. On Washington’s end, the difference was Vokoun, who stymied Florida’s every attempt on offense in making 42 saves to earn his fourth shutout of the season. Vokoun said that the high volume of shots actually helped him to get into a rhythm, while Perreault’s early goal let him relax with the knowledge he had wiggle room to play aggressively. 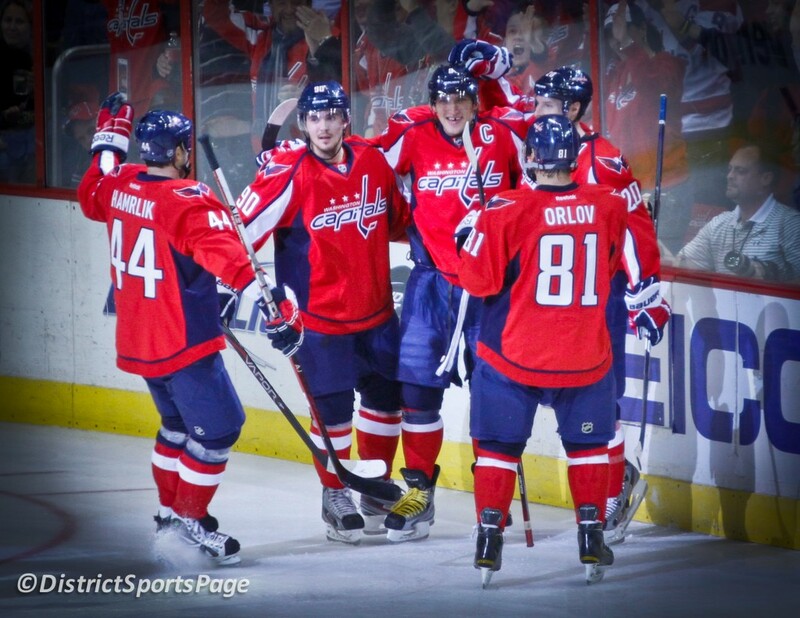 Teammate Brooks Laich called Vokoun “the difference maker” in Washington’s win, and Hunter agreed. Laich himself was also a source of inspiration for his teammates, skating fifteen shifts for 9:28 of ice time just two days after suffering what looked to be a serious knee injury in a loss to the Boston Bruins. With Hunter using Laich in a limited role on the fourth line, that allowed the makeshift second line of Chimera, Perreault, and Alexander Semin to earn the start, and shine on their first shift of the game. Florida defenders Erik Gudbranson and Brian Campbell appeared to still be waking up from their afternoon nap when Semin dumped the puck behind the goal line and Chimera quickly tapped it out to Perreault in the slot. All alone, Perreault took a wrist shot that slipped under Clemmensen’s pads, the goalie’s stick still in the air as he reacted to the early attempt. “You never like to get scored on early like that and give [the Capitals] credit because they came out with a lot of jump,” said Matt Bradley, a long-time Cap who signed with the Panthers over the offseason. Early in the second period, holding a 2-0 lead but on the penalty kill against Florida’s 8th ranked power play unit, Washington all but salted the game away just 61 seconds in the game when Chimera scored a shorthanded goal to put the Caps up 3-0. Chimera and Matt Hendricks pushed across Florida’s blue line with the puck, Hendricks dropping the puck to a trailing John Carlson while Chimera crashed the net. Carlson’s slap pass to Chimera was a beauty, and while Clemmensen made the initial save, the Panthers goalie left the puck just sitting in the crease for Chimera to easily tap in for his 15th of the season. Throughout the Caps locker room, playoffs was on players’ minds with the win. Laich kept some perspective though, noting that the Panthers “are a good team and by no means does this mean that [our] division is wrapped up.” With 29 games remaining in the season, a lot can change, and Washington will need to find a way to keep up its current pace to stay off the bubble and guarantee a playoff berth come April. See warmup and game photos here.